August has come and gone. Here in the DC area we got shaken up by an earthquake, brushed by a hurricane, but we’re still standing. Now we head into another month and it’s time once again for an accounting of who I am and what I’m doing. Obviously the big news of August was mentioned a few days ago, being first short-listed then ultimately accepted by The Memory Eater. That puts two of my stories in the pipeline for upcoming anthologies. I’m still hearing occasional news about Steam Works, and the guy behind Memory Eater is super enthusiastic, so I doubt either will meet the same quiet end as my ill fated first anthology pick-up. That means I still have three stories out, at least one of which (hanging out at Writers of the Future) I expect to hear news back on this month. Originally August was going to be about getting back to work on Capsule, but I got hit with the full inspiration for a short story I’ve been meaning to write for awhile called The Ghosts of Venus. Wrapped up the first draft yesterday, and I’ll say it’s first draft good. It needs a lot of work, and it’s going before my beta reading group this week. Speaking of which, check out the new CVS Website. It’s still a little light on content, but it’s also freshly relaunched, it’ll be growing. August started with the announcement of the Flashathon, and I’ve been posting new information as I have it. If I’m counting correctly today marks 50 days ahead of the event. We’re putting plans in motion to have a few hours of guest inspiration as part of the event, which will be just damn cool if it actually happens. Details will come faster and faster as the marathon approaches, I’m sure. September dawns with me not sure what my next writing project is. We’re coming up on the deadline for the Dark Tales of Lost Civilizations anthology, but my concept for that is still in a very natal form. I’ve got another story concept that has nothing to do with any current anthology calls but could be good for making a general tour of the journals. Or maybe this time I really will get back to work on Capsule. Anything could happen, it’ll probably come down to what inspiration hits me first. State of the Writer’s Beer: We’re giving Lazarus Ale a little more time in bottle, so very little New Peculiar was drunk this month. I’m under a promise not to start brewing another batch until we’ve gone through at least another dozen bottles of our current batches. State of the Writer’s Blog: Added several states to my goal of getting visits from all 50. This month saw the first visits from Alaska, Nevada, Vermont, Rhode Island, and Delaware. This leaves me just Montana, both Dakotas, Arkansas, and Louisiana to go. 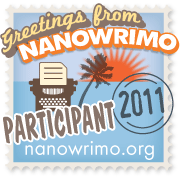 I knew I should have had Renee pop into my blog briefly while she was in New Orleans. The month also saw the site smash previous viewership numbers with over 275 hits and 400 pageviews. Those are still tiny numbers, but they rapidly growing numbers. It was as recently as May that I crossed 100 hits in a month for the first time. Hopefully with the upcoming Flashathon and publications, numbers will improve that much more. State of the Writer’s Pseudonymous G+ Account: I said in my last post about the Google+ pseudonym issue that I would feel pretty safe if I made it to the end of the month. Well. I’ve made it to the end of the month. So either the policy is being very poorly enforced, or initials don’t count towards the pseudonym policy. Either way, I’m feeling rather more comfortable that the account will remain. So now, that’s a month over and retrospective given, let’s look ahead. Onward to September! 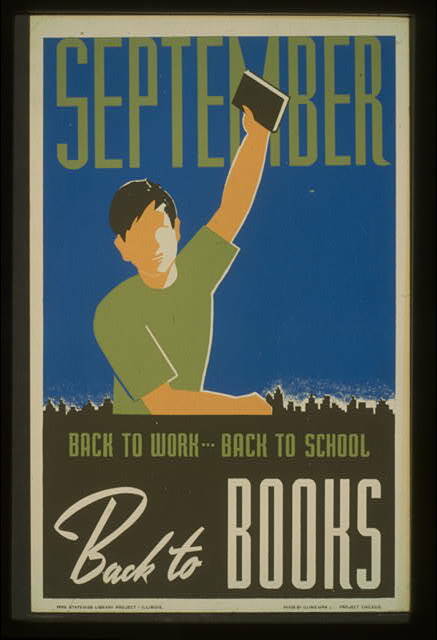 September poster product of WPA and released to Public Domain by the US Government. What’s that sound you hear when you push the play button? That’s the sound of Google+ doubling down on their real name policy. I’ve been on Google+ for just under a month now, and I’ve yet to receive any official harassment over my use of two initial in place of my real first name on my account. But I also came online between the time that Google was under initial fire over their heavy handed assault on pseudonyms on their service and this new restatement of their policy. I’m not sure how thoroughly they’re looking through accounts looking for people like me, but it would seem a trivial matter to make a bit of code that would spit out all accounts with two capital letters as a first name. So are they looking for me? I don’t know. Will they find me? I can’t say. Will they care? That’s obviously the most important of the questions. Google+ makes connecting with people on the web more like connecting with people in the real world. Because of this, it’s important to use your common name so that the people you want to connect with can find you. Your common name is the name your friends, family or co-workers usually call you. For example, if your legal name is Charles Jones Jr. but you normally use Chuck Jones or Junior Jones, any of these would be acceptable. If you use your full name, you’ll be able to connect with people you know and help them find you. Names that consist primarily of initials or those that include indications of membership in professional, educational, societal or religious entities, such as “Dr.”, “Rev.” or “JD” are not allowed in the first or last name fields. Names that include more than one language script aren’t allowed either. So name variations are okay, except when they’re potentially not because they “consist primarily of initials.” That word, “primarily,” is an odd choice. Especially as opposed to a word like “entirely”. Does a first or last name replaced with letters end up “primarily” made of initials? There’s rumors of some clarifications of this policy allowing the use of initials as long as they are the correct initials, but this is me looking directly at their stated real name policy, which really is where they have to clarify issues. There’s a bit of a war of words online that has heated up again due to the restatement of policy. I’m not trying to be part of that here, largely because I’m using a pseudonym for marketing purposes, not for any actual worry of online harassment caused by me linking my online and offline personas (whatever that means anymore…and interesting that Firefox spell check doesn’t consider persona as a word that can be pluralized). As with the last time I wrote about the policy, I can understand these concerns, and this isn’t a field that I’m going to wade into because I’m just not qualified to talk about it. I’m also not trying to equate me wanting to use DL instead of David to create a little online separation from other David Thurstons with someone trying to escape physical abuse and still try to enjoy online social media. There are plenty of people defending Google in this case, espousing their right to make people sign up for their service however the hell they want to. And that’s perfectly correct. I also have the right to ban anyone here from commenting if I don’t like their user name, their content, or the like. And in both cases, people have a right not to use a website if they don’t like the terms of service. But that doesn’t mean that people also don’t have the right to speak out against those terms of services if they disagree with them. And here’s where the issues hit. Yes, Google has the right to control their user base, but they’ve become so big and are trying to link so many products together that to not listen to concerns on issues such as the pseudonym issue is going to make them look tone deaf, and will ultimately drive people away from their services. Will it be enough to hurt the company? Perhaps not. But I would hope that a company founded around the concept of “do more evil” would care about something other than the bottom line when making decisions like this one. And in the end, it’ll still likely come down to a judgement call by someone, because the only thing that an algorithm can flag is plausible sounding names. They can search for symbols, search for key words that are unlikely parts of names (common vulgarities, say), search for initials, but in the end someone using the pseudonym *BunnyLover12* is going to stand out while someone using the pseud0nym Ezekiel Spaulding will fly under the radar. That means, in the end, that the pseudonym policy can only ever be unfairly or unequally enforced by Google unless they require some personal verification from the word go to make sure that everyone is exactly who they say they are, rather than relying on tracking people down who are already signed up and using the service. So I will persist on Google+, largely out of a curiosity to see what will happen to my account, probably using it lightly as though tip toeing over uncertain terrain. If I survive the next two weeks, especially with the double down in effect, I’ll see it as a tacit approval of my account name, as well as a tacit approval of accounts using their first and middle initials in place of a first name. And if I get hit with a change name order? Oh, you’ll hear about it, don’t worry. I’m on Google+ now. Isn’t that exciting? This is me, for anyone who doesn’t yet know. I’m still trying to figure out the best use for it. Right now it’s turning into the home for thoughts that are a little too long for Twitter, but not fully formed enough to be a blog post. You’ll note my name over there. I’m DL Thurston, just like I am over here, just like I am on Unleaded, just like I am when I enter my weekly writing contests, and just like I am when I submit to anthologies. That isn’t strictly my name. Pull out my drivers license and it says David Thurston. But when I was starting out as a writer I found there were too many David Thurstons in the world, and I was worried it would be harder to get my name associated with myself. Yeah, apparently I’ve been concerned about branding since the very beginning. So I chose to go by my first two initials, unpunctuated, instead. DL Thurston. It’s fantastic. With the exception of Twitter, where I found DLThurston already taken, it’s allowed me to directly control who DL Thurston is in the world. Now there’s Google+. Yes, I’m DL Thurston there too, but if you read their terms of service very careful, it’s hard to tell whether or not I’m in violation of them, but the answer is probably yes. And this has become an important issue the last few days as Google has started going after accounts registered to pseudonyms. This likely isn’t news if you’ve been in and around blogs the last week. People have lost not only access to Google+, but also to their gmail accounts, their Google Docs, their backups, their calendars, to any of the number of services that Google has implemented to make the company indispensable to modern life. There are plenty of valid concerns from people who operate online under pseudonyms because of their job, or because they have a safety need to divorce their opinions from their actual name. These have been discussed, and I’m not looking to minimize those concerns, but as this is a writing blog, I’m going to approach this from a writer’s perspective. We live and operate in a world of pseudonyms. We publish under identities that are not quite our own, whether they be variations of our name other than our direct given and legal first and last names (what Google potentially wants based on some readings) or complete fabrications. That’s who we, as writers, are. That’s who people will look for. People want to find Joe Hill, not Joe King. They want to find J. K. Rowling, not Joanne Rowling. While neither is on Google+ yet, if they were then the names they write under would both be a technical violation of the first name, last name policy that is in the Google terms of service. And if Google is going to implement a policy so strict as to not allow any pseudonyms on the service? Then it’s going to likely end up largely rejected by the writing community. And if Google tries to use some sort of fame-and-influence metric when determining to allow something like J. K. Rowling but not something like DL Thurston, then they’ll probably have a bigger PR issue on their hands. Now, I’ve not had any direct problems with my account, I want to be very clear. Google is apparently only looking for things that are overtly pseudonyms. For now, at least. But to me this is a very real concern. It’s part of why I’m glad I have a separate account for my Google+ profile and for every other Google product. And if they’re shutting down access to all Google products for flagged pseudonym accounts, that might not be a bad approach going forward. Lot of people use Google for backing up their stuff, hell, I’ve even recommended that in old blog post here. Lot of people use Google for working copies of documents, because it makes them mobile. Lot of people use Google for a lot of things, because that’s how they’ve set themselves up, and always with that motto of Do No Harm. This? This is going to harm. This is going to harm people, this is going to harm the reputation of the company, and this is going to harm adoption of the new Google+ service. For now? I’m using it. I’m liking it. But I’m also wary of how I’m using it, and I’m not putting anything up that I don’t mind losing if they shut off my access. And it’s an issue that anyone who doesn’t write entirely under their legally given first and last name should be aware of, and should keep an eye on. Branding is important to the modern writer trying to (no pun intended) make a name for him or herself, and if it’s a choice of being on Google+ under a name other than what I publish as, or not being on at all? I’ll probably pick the latter. I just hope that’s not a decision I have to make. Over in Unleaded I talked about my inspiration for A Warning, but last night I was given a little lesson learned: when you’re making up names, it doesn’t hurt to quickly Google them. Ya know, just in case they’re a relatively famous singer whose name you just weren’t aware of. That is, mind you, an oddly specific example. While names are certainly not unique to individuals (there’s a reason I use “DL” as there are far too many David Thurstons in the world…and even then someone beat me to DLThurston on Twitter, hence the underscore there) it can be distracting for a reader to come across a famous name being used for a character that is not intended to be that famous person.